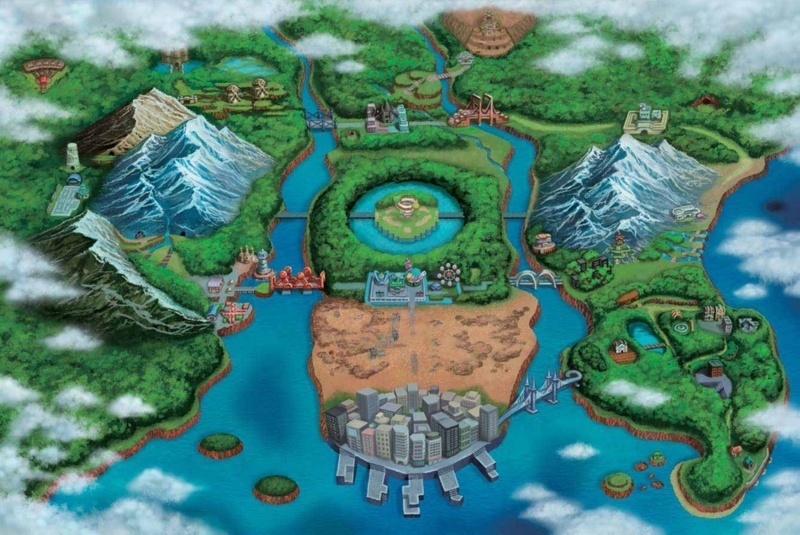 The Unova region is a large area of the Pokémon world. It is far away from the four other large regions, and the Pokémon which inhabit Unova are diverse and different from those of Kanto, Johto, Hoenn, and Sinnoh. Unova is divided by two rivers that lead into an ocean to the south of it. It divides Unova into central and eastern peninsulas and a western landmass. These three landmasses are connected by five bridges, the Skyarrow Bridge, the Driftveil Drawbridge, the Tubeline Bridge, the Marvelous Bridge, and the Village Bridge. The eastern part of Unova is further divided by mountains that makes a southeast part and northeast part. "Hello Trainers, Breeders, Researches, Athletes, and whatever the heck you may be! This broadcast was sent to you to let you know there will be a wonderful festival going on in the Sinnoh Region!! You should forget what you're doing and go to Hearthome City in the Sinnoh Region to have lots of fun with you and you're Pokemon! Don't worry Cruise line's are free and so is air transportation for a full week! So take the opportunity and have some fun in the Sinnoh Region in Hearthome City!! !